LIVE TIME LAPS OF THE DAY! 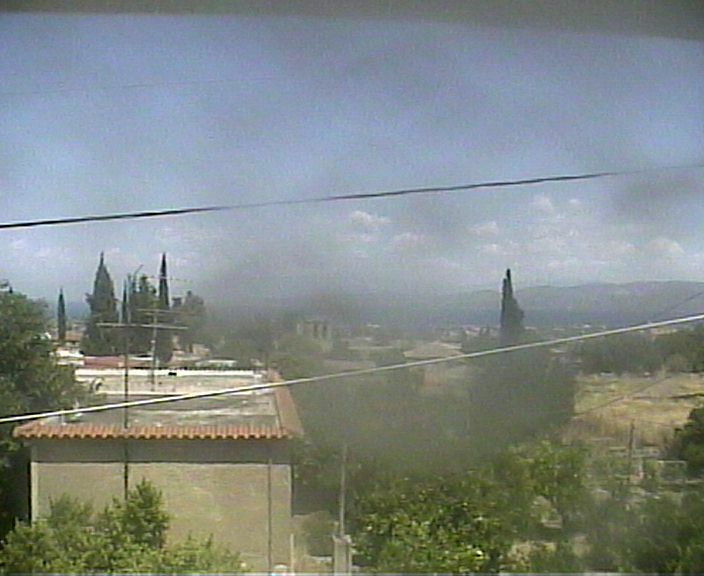 Temple of Apollo Live Web Cam Now! See daily slide show of images! Ancient Corinth was inhabited in the Neolithic period (6500-3250 BC). But the big prosperity begins in the 8th century, when it became a leader of the Greek world, spearheading the establishment of Greek colonies in the western Mediterranean, including Syracuse. The city remains strong as the Hellenistic period, until its destruction by the Roman general Lucius Mommios in 146 BC Sample korinithiakis leadership, especially in ancient times, is the Doric Temple of Apollo, built in 540 BC. The town is populated again by Julius Caesar in 44 BC, is growing again and the 51-52 AD visited by the Apostle Paul. The center is organized south of the temple of Apollo and included shops, small temples, fountains, baths and other public buildings. In 267 AD, the invasion of the Heruli, begins the decline of the city, although it survives despite repeated invasions and destructions, until it was liberated from the Turks in 1822. Limited in scope and results of research done in the years 1892 and 1906 by A. Skia expense excavations of the area continued to nowadays, started in 1896 by the American School of Classical Studies. The wealth of Corinth rested largely on control of trade in western Mediterranean. In the late 6th century Corinth sought to maintain this commercial hegemony by mediating conflicts arising between its neighbors, specifically Athens, Thebes and Sparta, and by contributing to the Pan Hellenistic efforts against Persian attempts to subdue Greece. Corinth, or Korinth (Κόρινθος) is a Greek city, on the Isthmus of Corinth, the original isthmus, the narrow stretch of land that joins the Peloponnesus to the mainland of Greece. To the west of the isthmus lies the Gulf of Corinth. 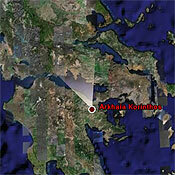 Corinth is about 48 miles (78 km) west of Athens. The isthmus, which was in ancient times traversed by hauling ships over the rocky ridge on sledges, is now cut by a canal. It is also the capital of the prefecture of Corinthia. The city is surrounded by Lechaio, Kalamaki, Loutraki, Geraneia mountains, and the southern mountains.